Movies Like 21 Jump Street: Action Comedies '+g+"
Like watching action comedy movies like 21 Jump Street then check our list of recommendations for movies similar to 21 Jump Street. It is a 2012 action-comedy movie directed by Phil Lord and Chris Miller based on an 1987 TV series of the same name. The story follows two underachieving cops (Jonah Hill and Channing Tatum) who are assigned an undercover operation of busting synthetic drug ring posing them as high school students. 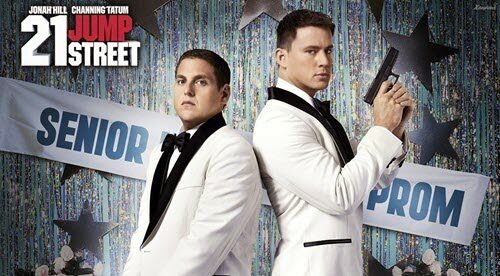 Since its obvious that 22 Jump Street will be similar to 21 Jump Street (Dah! it a sequel to it.) we are not including it in the list watch it if you haven't already. Don't forget to mention if we miss any other movies similar to 21 Jump Street as we keep on updating this list. Hot Fuzz is a 2007 action comedy movie directed by Edgar Wright. The story follows two police officers (an exceptional Nicholas Angel and his witless partner Danny Butterman) who are assigned to solve mysterious deaths in the sleepy village of Sandford. The Other Guys is a 2010 action comedy movie directed by Adam McKay. The movie follows two New York City desk cops (Will Ferrell and Mark Wahlberg) who seize an opportunity to step up their game and solve a huge crime like the top NYPD Detectives whom they idolize. Pineapple Express is a 2008 action comedy movie directed by David Gordon Green. The movie follows a pair of pot-smoking buddies (Seth Rogen and James Franco) who become involved with a vicious gang of drug dealers after one of them witnesses a drug-related murder. Project X is a 2012 comedy film directed by Nima Nourizadeh. The story follows 3 anonymous high school seniors Thomas (Thomas Mann), Costa (Oliver Cooper) and J.B. (Jonathan Daniel Brown) who plan to throw a birthday party that no one will forget. As the night progresses, word spreads and things go out of control. The Watch (2012),...if you can think of more don't forget to mention them in comments.